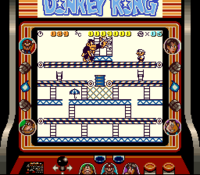 50m (or 50 m) is the second level of the Donkey Kong arcade game and Donkey Kong for the Game Boy. This level has a series of conveyor belts which run along the second, third, and fourth floors. Because of this, as well as the cement tubs that frequently appear as hazards, it was often nicknamed the "Pie Factory" level. This level has hammers to smash Fires and cement tubs. There are also ladders, which Mario must climb. The top ladders will also disconnect and connect when Donkey Kong beats his chest, which he does instead of throwing barrels like in the first stage. The Oil Drum in this level is in the middle of the stage, and will produce more Fire to burn Mario. Lastly, because the top floor is a conveyor belt, Donkey Kong will be moving left to right throughout the level. As Mario reaches the top, Donkey Kong will take Pauline again and will climb up to 75m. Bag: Stays on the ground, between the two ladders in the middle. Hat: On the far left of the center platform above the first conveyor belt. Parasol: On the girder located at the right of the platform with the hat on it. Note: the hat and the parasol switch places in the Game Boy Donkey Kong. This is the only level where Donkey Kong moves, though technically it is the conveyor belts which are moving. This level was removed from the NES version for unknown reasons (presumably the cartridge's storage limitations), though a newer port of the NES version (named Donkey Kong Original Edition) includes this level pre-installed for the European release of the Mario 25th Anniversary-styled Wii. Unlike the arcade version, Donkey Kong stays noticeably still, as he is considered a background object as opposed to a sprite. This page was last edited on April 12, 2019, at 04:12.